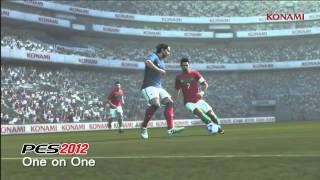 Pro Evolution Soccer 2012 (or PES 2012, Winning Eleven 2012 for classic fans) is the annual release of the football sim game by Konami. The game has been heavily focused on improving the play on the pitch, and succeeds for the most part. Because of licensing issues, there are still only a few fully licensed leagues in the game – but there are more licensed teams than before, and all players are realistically recreated. Improved visuals and AI continue to help pushing the series forward, and it remains a good alternative for your next footy fix. Upon launching the game, players are presented with a good set of setup screens which helps in customizing your gaming experience. All of the options are detailed with explanations, and it saves you from having to go back later and start adjusting preferences. PES once again offers a data saving system that’s confusing at first, but which also allows for quick switching between different profiles and settings. Still, there are a few too many menus to go though, and those new to the game will need time to adjust and find their way around. The lackluster design continues throughout the game – you will have to dig deep to find player ratings, and team overall ratings are also not identifiable when simply scrolling through. Speaking of the game’s database, perhaps the biggest drawback of the franchise has always been a lack of real teams and sometimes players. PES 2012 continues this trend, with only a few licensed leagues and teams, nowhere near the level of something like EA’s FIFA franchise. Fake team names, logos, and uniforms are all part of the course, and though it isn’t Konami’s fault, the lack of authenticity surely costs them sales every year. Thankfully, the developers have worked around this problem by offering full customization options. With a strong community following, modding PES 2012 is a possible, but lengthy process. On the up side, the EUFA-run competitions (Champion’s League, Super Cup) and all teams participating within them are fully licensed, as is the Copa Santander Libertadores. Most of the players are also in the game, so all the superstars are recognizable and accurate. 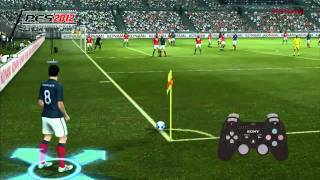 PES 2012 continues to be a feature-rich experience when it comes to gameplay modes, particularly online. In single player, the licensed EUFA and Copa Santander Libertadores competitions can be jumped into from the main menu with any participating team. Football Life now encompasses Become a Legend and Master League modes. New this year is the Training mode, which lets players get some practice with the game’s mechanics through a series of challenges. This mode is a good learning tool for inexperienced players, and also those wishing to practice advanced techniques without worrying about being in a live match. Master League is the default management mode of the game, where players can take control of a fake team and guide them to higher divisions and better players. Managing your squad, some finances and coaches is fairly straight forward, as is advancing time and playing through fixtures. The menu navigation again becomes a bit of an issue, as it’s sometimes unclear how to perform certain actions like negotiating a transfer fee. There are sometimes special challenges before certain matches, fulfilling which nets you extra bonuses and job security from the board of directors at the club. There aren’t any significant innovations in the mode, and it works well enough to get by. "This realism-focused footy title looks good, but stumbles a bit on the pitch"
Pro Evolution Soccer 2012 is ranked #643 out of 1435 total reviewed games. It is ranked #83 out of 112 games reviewed in 2011.